Rethink is a Toronto, Vancouver and Montréal based agency specializing in big ideas for advertising, design and online. Strategy Magazine’s annual rankings has consistently named Rethink as one of the most recognized and awarded agencies in Canada. Onboarded as an in-house full-time contractor for six-months. Below is a curated collection of some of the work done during my time at Rethink with fellow talented individuals. 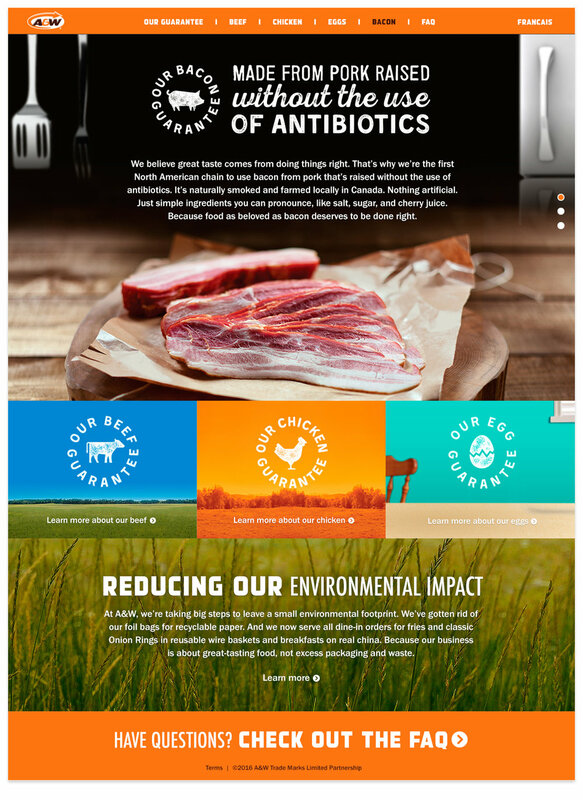 Rethink and A&W created a movement for "Better Ingredients". This was a tagline that recognized and guarantees A&W's ingredients are not affiliated in any way with chemical artificials such as antibiotics, steroids, or hormones. 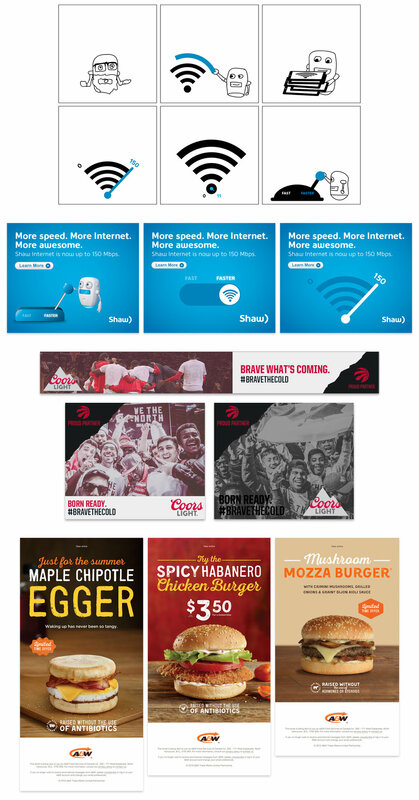 The A&W "Better Ingredients" campaign website had generated more website traffic than their very own A&W parent website, and was a huge success! With this success, I was tasked to continue their prosperity with a brand new campaign. This time, promoting their "Pork Guarantee". This responsibility meant a mobile-first approach in their existing web presence, aligning with the already set expectation of creatives both internally and externally, and pitching the work to the client myself. Considering this project was assigned with existing elements that already lived on the website, I had to come up with visual approaches that would fit the current aesthetic and theme of the overall website. On top of that, there were constraints on how we can slot in a new Guarantee as the original project had only three guarantees (beef, chicken, and egg). The client also had a certain kind of expectation, being fully aware of the scope of the ask. I presented the work myself to our A&W client in a room and they were incredibly impressed with the work with little to no feedback. It was an insanely huge success and the website is live as of today for your perusal. Below are some work done for Rethink's clients, particularly ad campaigns. The work was composed of an intimate start-to-finish process, such as sketching creative concepts, collaborating on concepts with Copywriters, storyboarding, and finally, designing the actual digital ads myself. We would work closely with Art Directors ensuring that we're heading towards the right direction. From then, we would walk through the concepts and designs to our Creative Directors, either to revise and/or to get their sign-off. Once a work has been signed off, we would pitch the work to our clients and ensure they're happy with both concepts and execution. If everything is all fine and dandy, I would then work closely with the developers with the designs, where they come in and do their wizardry, and voila—all the work comes to life. Banners animated by the talented Ken Malley.